Also serving communities of North Providence. There are 35 Assisted Living Facilities in the Johnston area, with 3 in Johnston and 32 nearby. The average cost of assisted living in Johnston is $3,230 per month. This is lower than the national median of $3,346. To help you with your search, browse the 151 reviews below for assisted living facilities in Johnston. On average, consumers rate assisted living in Johnston 4.2 out of 5 stars. Better rated regions include Providence with an average rating of 4.3 out of 5 stars. Caring.com has helped thousands of families find high-quality senior care. To speak with one of our Family Advisors about assisted living options and costs in Johnston, call (855) 863-8283. Conveniently located immediately west of neighboring Providence, Rhode Island’s capital and largest city, the suburban town of Johnston offers seniors a peaceful residential haven and quick access to city amenities. To accommodate its sizeable senior population of 20.5 percent, Johnston has three assisted living facilities, and there are 32 others in surrounding cities and towns, such as Providence, Warwick and East Providence. These facilities are referred to as assisted living residences (ALRs) and are governed by the Rhode Island Department of Health, Center for Health Facilities Regulation. The state of Rhode Island partially taxes security income and fully taxes retirement account withdrawals and private and public pensions. This is in addition to the high cost of living in Johnston, although all prescription drugs and most groceries are exempt from sales tax. These financial factors are important points to consider for retirees with assisted living budget concerns. Being safer than 50 percent of the cities, towns and other areas in the U.S. and with an overall crime rate that's 33 percent lower than other communities in Rhode Island, the town of Johnston offers seniors and their loved ones peace of mind. To get around Johnston and the rest of Rhode Island, low-income seniors and persons with disabilities are eligible for reduced fares on RIPTA (Rhode Island Public Transit Authority) fixed bus routes. The Johnston area is home to world-class medical facilities including Atwood Medical Center, Atmed Treatment Center and Brain & Spine Neurological Institute in the event of medical emergencies or illness. A variety of arts and culture options are available for seniors in Johnston. Seniors may watch local performances from Johnston Dance and Performing Arts, visit the Clemence-Irons House at a discounted ticket price and participate in activities by the Johnston Senior Center such as quilting, calligraphy, crafts, foreign language and exposure trips outside of town. Johnston has an array of community resources for seniors including Tri-County Community Action Agency, an organization that has dedicated programs for seniors and disabled adults on various forms of assistance on legal, insurance, tax, health, heating and other matters as well as one senior center. Assisted Living costs in Johnston start around $3,230 per month on average, while the nationwide average cost of assisted living is $4,000 per month, according to the latest figures from Genworth’s Cost of Care Survey. It’s important to note that assisted living rates in Johnston and the surrounding suburbs can vary widely based on factors such as location, the level of care needed, apartment size and the types of amenities offered at each community. 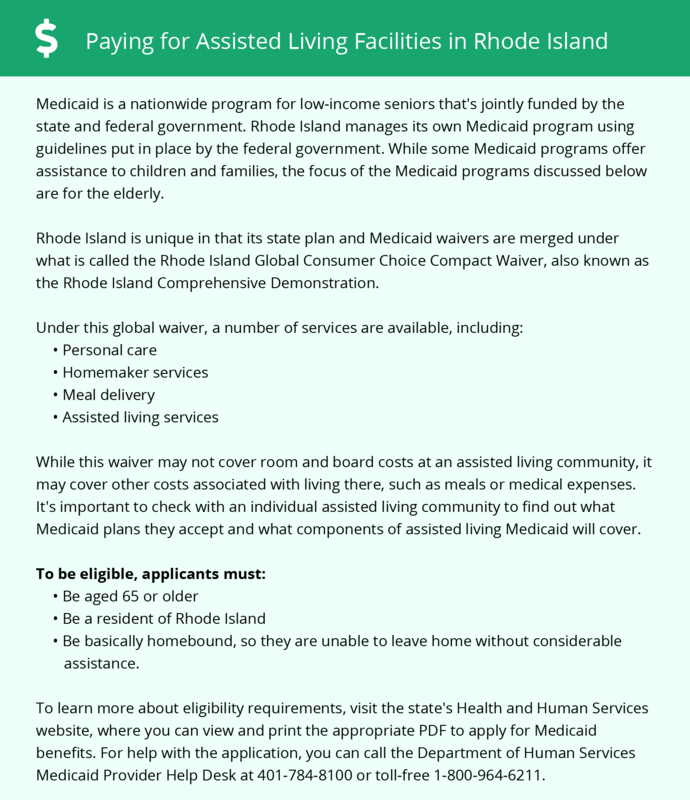 For elderly residents in Johnston to be eligible for financial assistance on assisted living services, they may avail of the SSI Enhanced Living Assistance Program for low-income individuals and/or the RI Global Consumer Choice Compact Waiver for Medicaid recipients. Johnston and the surrounding area are home to numerous government agencies and non-profit organizations offering help for seniors searching for or currently residing in an assisted living community. These organizations can also provide assistance in a number of other eldercare services such as geriatric care management, elder law advice, estate planning, finding home care and health and wellness programs. To see a list of free assisted living resources in Johnston, please visit our Assisted Living in Rhode Island page. Johnston-area assisted living communities must adhere to the comprehensive set of state laws and regulations that all assisted living communities in Rhode Island are required to follow. Visit our Assisted Living in Rhode Island page for more information about these laws.